Diamonds can be incredibly beautiful. Their path from under the ground to a hand near you is an incredibly interesting one. Diamonds are made up entirely of carbon. Pressure (diamonds can’t form above 100 miles below the earths crust) and temperature (750+ degrees F) are the factors that “change” the diamond from mere carbon into a treasured commodity. After millions of years undergoing this pressure and heat, the rough stones are settled in diamond-bearing rock and from there, wait for a volcanic eruption to bring them to the surface. Pipe Mining: Primary Source-refers to the process of diamonds emerging to the earth’s surface in host rocks through volcanic pipes, which are pathways between the earth’s mantle and surface. When an eruption occurs, other materials are carried up along with the magma, or lava. If the eruption originates far enough down in the earths surface, it could contain diamond-bearing rock, usually kimberlite or lamproite. These eruptions must be extremely forceful and move at high speeds, for if the diamonds remain in the magna for a long period of time, they could burn up if the temperatures or turn to graphite. From here, they conduct a process called open mining where the surface remnants are inspected for diamonds. Once those are exhausted, large shafts are plunged into the ground next to the volcanic pipes and more diamond-bearing rock is recovered, and taken to a screening plant where the soil is separated from the diamonds. Alluvial Mining: Secondary Source- Refers to the removal of rough diamonds that have been relocated to oceans and riverbeds through erosion. After an eruption occurs, some of the diamond bearing rock is displaced, often settling in ocean beaches and river beds. To extract this valuable substance, a process of Alluvial Mining is conducted. In order to remove the rock from these areas, the water must be pushed aside to get to the floor of the ocean or river. Usually a wall of mud and stone is constructed. From there, the miners using bulldozers or pumps bring the rock to the surface. It is then taken to a screening plant where the soil and silt can be separated from the rough diamonds. After the rough diamonds are mined, less than 20% are gem-quality, the other 80% have other uses. If not gem–quality, they fall into one of two other categories Near Gem-Quality or Industrial use diamonds. Gem Quality: Approximately 20% of diamonds mined fall into this category. These are high enough in quality to be used in diamond jewelry. They range in clarity from Flawless to Visible Inclusions. Near Gem Quality: These fall in a category between gem quality and industrial, so they need to be individually evaluated to determine if they could be used in jewelry in some way or if the quality is just to poor they are used in industrial ways. They range in clarity from Visible Inclusions to industrial quality. Industrial Quality: These diamonds are badly included stones and are functional only for industrial use; for example drills and saws or earthmoving equipment. These are categorized as industrial quality clarity. 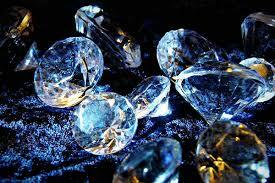 * Diamonds are a world wide source, mines are found in 25 countries and on all continents except Antarctica.